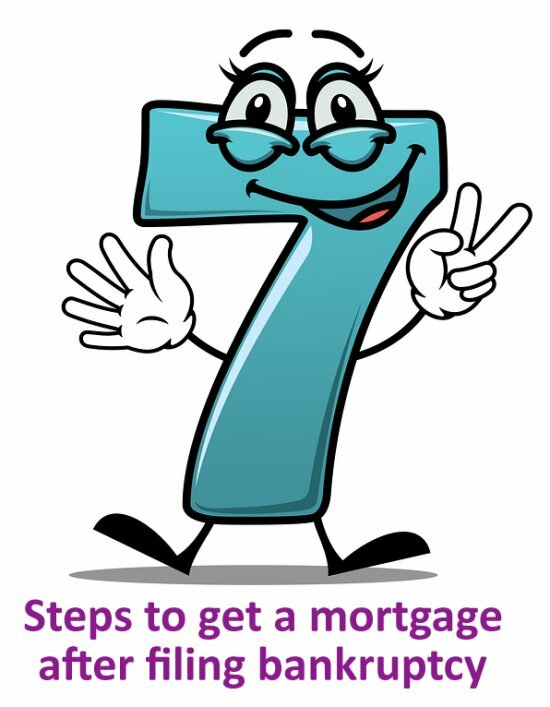 After chapter 7, you will have a two year waiting period before you can get an FHA loan and four years for a conventional loan. For a chapter 13, the waiting period is one year after discharge for FHA and 24 months after discharge for a conventional loan (or 48 months after a dismissal if your repayment doesn't run its course). The only way to circumvent these rules is to work with a private lender – one that finances the home without a bank. The best way to get a good deal on a post-bankruptcy mortgage is to have the best possible credit score. Filing bankruptcy will lower your credit score but this will be partially offset by the fact that accounts that were getting hit by negative ratings each month for non-payment or late payments won't be continuing to degrade your credit report. After a couple of months, getting a secured credit card and keeping the balance low is a good start. From the moment your bankruptcy gets the green light, you get a fresh start. It's up to you to make the most of it. The first step is making sure you pay all your bills on time, every time. This is a critical step in re-establishing your credit. Also, don't incur more debt than you can manage now that you've gotten yourself in a better financial position. If you ever have to prioritize one bill over another, if possible, pay one that reports to a credit agency. Because you've filed bankruptcy, you will likely not get the best interest rates. One way to counter this is to have a more substantial down-payment. Borrowers should try to have at least a 5% down-payment but the more you can muster, the better. A 10% down-payment is what to shoot for to get better interest rates and to let the lender know you're committed. All lenders are not the same. You'll want to consider different lenders from banks to credit unions to those that specialize in mortgages. There are lenders you can meet with in-person and many firms you can check out that are on-line only. Do a lot of research and compare different offers before settling on what you think is your best possible rate. In addition to interest rates, consider the reputation of your lender. Most lenders are above-board but there are some that prey on those with less than stellar credit or those who are naïve about the process. These are called “predatory lenders” and often target those in financial hardship and offer them loans when others won't, but at very high rates. If this is the only kind of loan you can get (called subprime) then you should save up more money, work on your credit and wait. One common circumstance we see with our clients is that they purchased the most home they could get a mortgage approved for and then when the real estate market, or their income, dipped they ended up in over their head. This is not the best strategy for your future financial well-being. Instead, buy a home where the payments will be affordable even if you're not earning at your maximum, or, for two earner families, that you can afford if one earner can no longer work. If your debts are overwhelming and you need permanent relief, you should know that bankruptcy doesn't represent an end but, rather, a fresh start. Contact the law offices of John T Orcutt for a free consultation on how chapter 7 or chapter 13 bankruptcy can help you get out of financial quicksand.